I should probably start this review by giving credit to Jasper, he’s the guy that told me about this group and made me review them. He is also responsible for getting me into Cage The Elephant, who are just the best modern rock band. Plus he’s the guy who shares my love of The Avalanches, Cee-Lo (when he was a rapper), and OutKast. So anyway, Balance and the Travelling Sounds are a 7 piece band, from the west coast of the US, made up of a producer, a singer, an MC, a saxophonist, a guitarist, a bassist and a drummer. 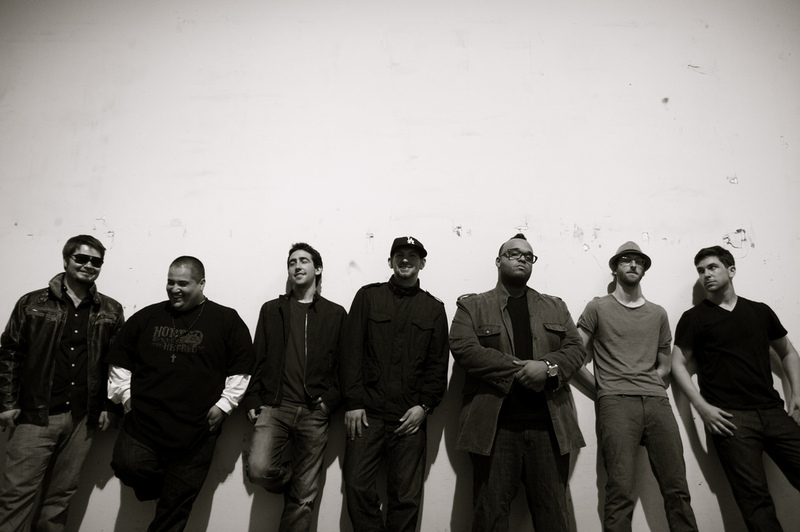 This gives them the perefect fusion of hip-hop produced sound, while at the same time, keeping the live soul/jazz vibe that is so essential for bands like The Roots. The first thing I was alerted to was their cover of a Daft Punk song and it is just absolutely perfect. One of the most chilled yet funky songs I’ve heard for a long time, each instrument working perfectly in sync with the band and the vocals and MC are beautifully understated, complementing the song expertly. Here it is below. Before we go any further I should say that you can buy a 6-track EP featuring a studio version of that song, for any price INCLUDING FREE. So you should all head to http://whensoundstravel.bandcamp.com/ to pick that up right now. Their full length album, Travel Guide Vol. 1, shows are much more DJ focused sound, that is reminiscent of The Avalanches. Nevertheless, the samples are interwoven with their own rhythm and melodies as well as a tight singing/rapping fusion. The core style of the album is laid back, relaxed, like OutKast’s most underrated album ATLiens. If there could be criticisms of this group then I’d have to say they can be a little too laid back, perfect for lying in bed or revising with, but not great if you’re walking around in the middle of the day or running to catch a train. As well as that they lack a clear standout song or single that really shows off their prowess, excluding the Daft Punk cover, as they didn’t write it. But don’t let these comments colour the judgement of the band, because what they do, they do superbly. Any attempt to make an upbeat mainstream single would probably backfire and sound cheap and manufactured. Instead, relish in the smooth, laid-back vibes and kick back.It must be said that these two records are begging to be heard on vinyl, as the only factor that could possibly improve them is the crackle of needle on black plastic. I have no doubt that this is a group to watch as if they continue what they do, they will undoubtedly not only get even better, but have the success that they deserve. I urge you all to give them a listen and download their free music. You can check them out via their website, bandcamp, YouTube, twitter or soundcloud. ah thats gutting, still i hope they get some of the hype they need!